Among the rolling hills and mountains of Vermont is a collection of white clapboard buildings around a picturesque town square that marks the small town of Danville. Danville has been aptly named "Village in the Hills" for its location perched high in the hills. It has sweeping views of valley farms below and stretches of hardwood forests covering the surrounding hillsides. Danville was once the "shire", or county seat until nearby St. Johnsbury claimed that designation in the 1800s. Just 48 miles from the Canada-US Border, these two communities offer a beautiful weekend visit. 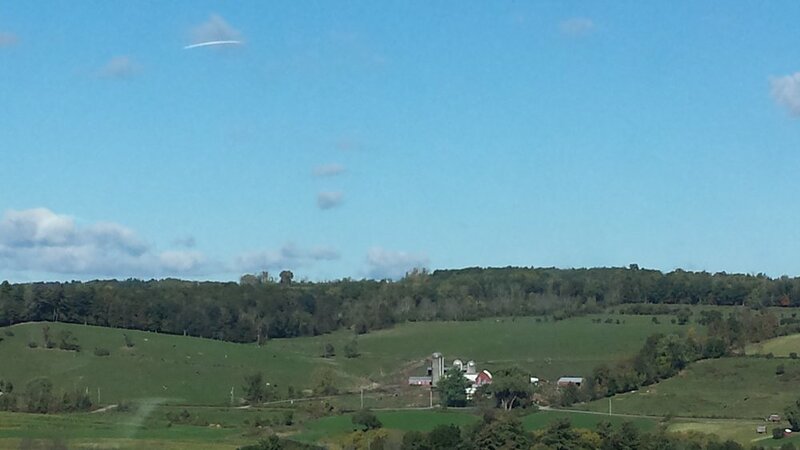 In the fall, the autumn color spreads like a blanket over the mountains and in the Spring you can see the maple sugaring process in full swing. At any time of year, you can enjoy beautiful scenery and hometown events. As its name implies, the resort is perched high on the mountain ridge and enjoys lovely views of the valley below. The campsites are nicely wooded and arranged in clusters making them a bit close together. There appeared to be many seasonal units, but the park offers good service and accommodations for transient campers. The bathhouse is modern and clean, sitting conveniently next to the laundry. The park offers two pools, one is heated, and they are convenient to all sites. There is a terrific 18-hole mini golf course on property that includes hills, water hazards, and some interesting layouts. And, while the gift shop houses an arcade, you can keep the kids busy at the playground, fishing pond, volleyball court, basketball court, horseshoe pits or shuffleboard. If you stay" in-season" the park offers daily activities for the kids including a horse-drawn wagon ride. There is also access to the 100-mile LVRT trail just outside the campground. Maple Grove Farms Maple Sugar Museum - Situated conveniently next to the gift shop, this little self-guided museum illustrates the sugaring process from collecting the sap to boiling it down into one of several products: syrup, maple cream, and maple candy. Watching the short video made me want to return in the spring to watch the process! Fairbanks Museum and Planetarium - Great place to spend an afternoon with the kids or on your own. Fascinating natural history exhibits from the collection of the prominent Fairbanks Family. It houses the only public planetarium in the state and resident astronomers guide visitors on a tour of the cosmos. St. Johnsbury Athenaeum - One of the few public libraries with a National Historic Landmark designation, this remarkable place features a gallery of American paintings as well as the 8,000 volume collection from noted bibliographer, W.F. Poole. Founded by Horace Fairbanks as a cultural center for the town, it still acts as the town's library and art gallery. The Smallest library in Vermont - Originally opened in the late 1930's, this little building was converted from a gas station and served as the town's library for 60 years before closing. Several citizens devised a campaign to restore and reopen the tiny white clapboard structure and celebrated its reopening in 2017. Can't miss it on the main street in Danville! Quaint town square - A large band pavilion graces the green lawns as well as picnic tables and quiet surroundings. Danville Inn - Stop here for great breakfast served in a Victorian parlor surrounded by teapots. The food is very good and the hosts were charming. - Camera (or cell phone camera) the scenery is stunning. If you have a steady hand, a video of the streams would be terrific! - Hiking boots. The mountains are lovely and there are dozens of hiking trails to explore. 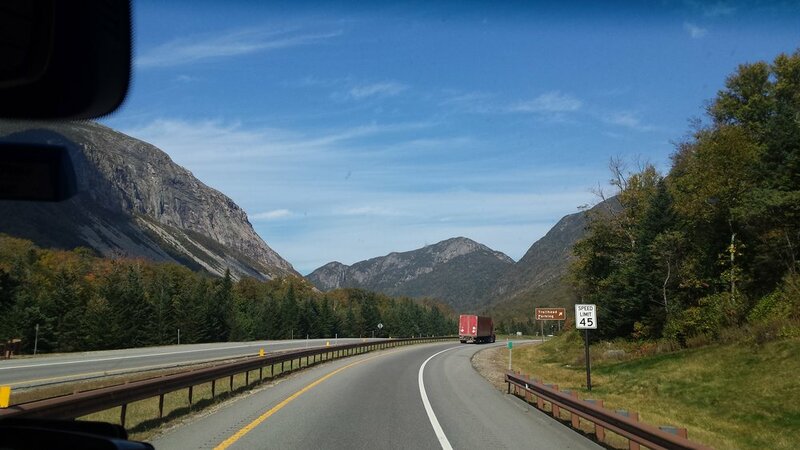 Our trip took us through New Hampshire and Vermont. 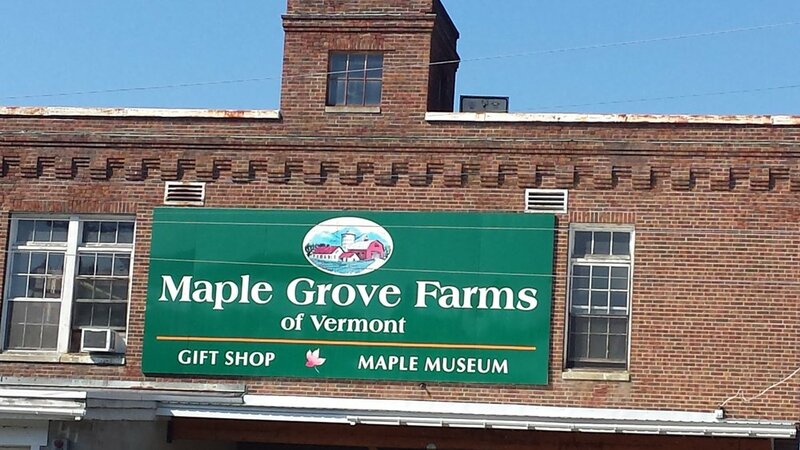 We stopped for a couple of nights in Vermont to see the maple sugar operations and the local farms and towns. 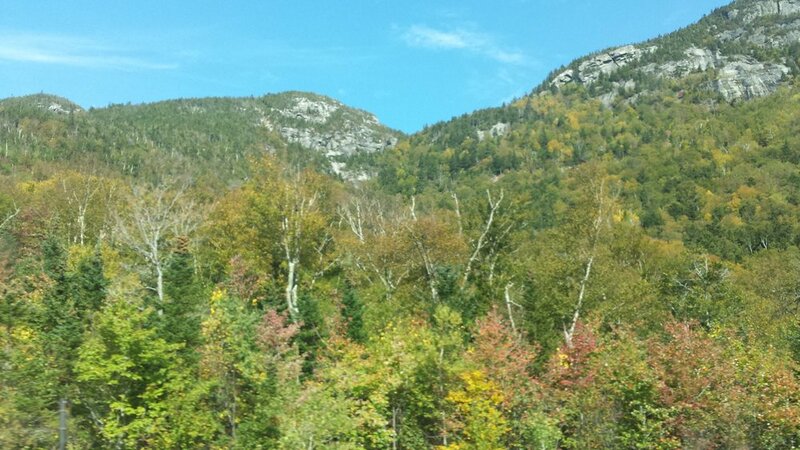 The scenery was stunning, with rolling hills and mountains just beginning to show autumn's color change. Our campground was situated between St. Johnsbury (St. Jay as the locals call it) and Danville. Both towns are good examples of small-town life. Danville, much smaller and arranged neatly around a town square is home to local farms and few businesses. Looking for breakfast recommendations, our camp host suggested the Danville Inn for breakfast. We found the restaurant tucked into the first floor of a Victorian house on the main street. Inside was a throwback to the days of velvet drapes and collectibles littering every flat surface. A scattering of small round tables accommodated the small group of people there. After placing our order, we looked around at the decor - teapots, everywhere! Since I collect teapots, I had to browse their collection and marvel over the variety. Our breakfast order arrived and provided picture perfect corned beef hash with eggs and homemade blueberry pancakes served with warm locally-made syrup. A great way to start the day, indeed! Our mission was to find a farm that could show us the maple sugaring process. We read brochures and websites trying to navigate the narrow back roads to no avail. After some additional research realized it was the wrong time of year. Maple Sugaring occurs in the spring as the sap rises in the trees after the long winter hibernation. Almost every farmer who has Sugar Maples on their property will collect and process sugar. It is not a solitary "crop" but simply another spring chore on the farm. There are, of course, places to purchase the authentic product and learn about the historical process. We opted for Maple Grove Farms Gift Shop and Museum. The operation in St. Johnsbury consumes a large facility and offers visitors a self-guided museum to see how the sap is gathered and processed. The folks in the gift shop are happy to explain the details. We learned that there are several products that result from processing Maple Sap. The first is Maple Syrup, which is delicious on pancakes and waffles. If you continue to heat the syrup you can get the second stage of Maple Cream which can be used as a delightful spread on toast or used as a garnish, and the third product, after boiling away most of the moisture, is Maple Sugar Candy. We sampled each and purchased a selection to send home to the kids and grandkids. The gift shop was happy to arrange the shipping and delivery! There is more to St. Johnsbury than maple sugar. The downtown is very nice, with older Victorian buildings and neatly kept homes and businesses. A museum and planetarium offer a great distraction for the kids while the historic Athenaeum provides a glorious step back into another era. The building's architecture is lovely, but the collection of American Painting is worth an afternoon's browsing. Docents are happy to interpret and offer history on the collection. If you are a bibliophile, you will enjoy the 8,000 volume original collection of noted bibliographer W. F. Poole as well as the other 45,000 volumes available to the public. Our visit drew to a close and at the end of the day we retreated to the campground. At this time of year, there are few people about, so we had the 18-hole mini golf course to ourselves. We laughed as we brushed away the autumn leaves from each hole and wondered if that was part of the hazard! Jim took the honors on almost every hole, but I did finish with a respectable enough scorecard. Winner buys the ice cream! We strolled back to the RV to prepare for our continuing trip south and talked about returning in the spring. That maple sugar thing just captured my imagination. I would love to see that or perhaps be a part of that event.